REMINDER! Father’s Day is this Sunday, June 21st I REPEAT, this SUNDAY! I am sure that we all remembered and have extravagant plans for the fathers in your lives, but for those of us that are too busy to even remember what day it is, let’s do something special! Nothing feels better than doing something memorable for the dads that helped us fix a flat tire on our cars, taught us how to tie our shoes, and told us that we were ready to take off our training wheels (even when we thought we weren’t ready). A vegetarian/vegan meal will be different and adventurous for our dads on their special day. Cooking is always a thoughtful and caring gesture, especially when it’s made mindfully, like these recipes below. 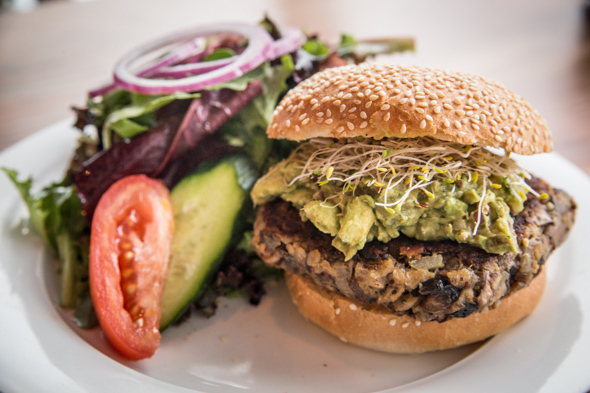 If your dad likes to order a big burger or a steak every time he goes out to dinner, these vegan sliders and portabella veggie burger recipes may just be a nice switch up for those carnivore dads. Slowly sauté, the onion to a large skillet seasoning with a pinch each salt and pepper. When the onions are soft turn up the heat to medium and add the mushrooms. Cook until the mushrooms and onions are slightly browned and fragrant – about 3 minutes. Remove from heat and add beans and mash. You’re looking for a rough mash. Taste and add another pinch of salt, or pepper if needed. Transfer the mixture to a mixing bowl, add the quinoa, chili powder and stir. Lastly, add the walnuts a little at a time until the mixture is thick and malleable enough to form into patties. Pop in the fridge for 10-15 minutes to cool and preheat your oven to 375. Coat a baking sheet with nonstick spray or olive oil. 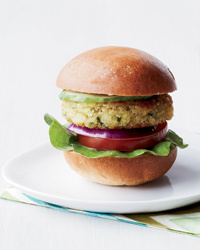 Once chilled, form into small patties. Arrange on the baking sheet and brush the tops with olive oil and another pinch of black pepper. Bake at 375 for a total of 40-45 minutes, flipping around the 20-minute mark. Cook longer to dry them out even more and achieve more crisp, but it’s not necessary. For a quicker option, form into thinner patties (1/4 inch) and brown in a saucepan over medium to medium-high heat lightly coated with olive oil. Cook until brown on both sides – 3-4 minutes on each side. In a large bowl add 1 cup of black beans and mash with a masher (chunks are OK). Add in the mushrooms, the rest of the beans, broccoli, garlic, onion, Worcestershire and steak seasoning. Add in the eggs, cheese and bread crumbs and mix gently with a large spoon until the mixture is combined. Set aside while you place a medium non-stick pan over medium heat and add in 2 Tbl of oil. Once the oil starts to shimmer (about a minute or two), using dampened hands (the mixture will stick to you if you don’t), scoop a 1/2 cup of mixture into the palm of your hand and gently shape into a burger all the while pressing together. The mixture should hold a burger shape. If it doesn’t add just a Tbl more of bread crumbs. Place in the oil and cook for 3-5 minutes per side or until golden brown and a crust has formed on each side. Not only will these meals be delicious, they will be beneficial to our dads’ heart health and keep them feeling young and energized! Ingredients: Red and white quinoa, kale, spring peas, zucchini, apples, scallions, toasted almonds, avocado, and sunflower seeds. This is one of my favorite summer quinoa salads. Made fresh with local farmers market veggies and full of fresh herbs, tossed in a light lemon-basil vinaigrette. It’s also vegan and gluten free. 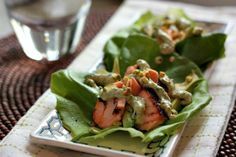 Light, but filling, this nutrient-dense salad will keep you energized and full throughout the day, without weighing you down. It’s a perfect lunch and will add to your daily dose of fiber, protein, omega 3’s, antioxidants and B vitamins… and much more! 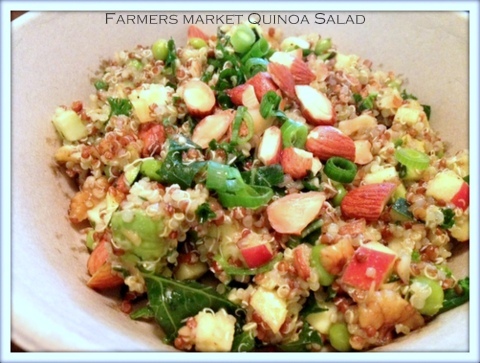 The Farmers Market Quinoa Salad is on the summer menu at the Galley Cafe, come and get it! The Galley cafe is located in the Vincera Institute at 1200 Constitution Ave, Philadelphia.